Those of us who love the beach know how disappointing it can be to find fewer and fewer places where public beach access is available. Taking into account the rapid development, hurricane threats and the continuing rise of sea levels, it was only a matter of time that San Pedro's beaches would show signs of erosion. In an effort to curb or reclaim the beach area at the Boca del Rio Park, the San Pedro Town Council (SPTC) has embarked on a project to install geo-textile tubes for the protection of the beach and to acquire an area for recreational purposes. A total of six geo-textile tubes measuring 45 feet in length and three feet in width are currently being installed and this will clear a 35 to 45 foot area of beachfront access. Councilor Severo Guerrero, who is in charge of the project which falls under his portfolio, stated that they have acquired the services of Armando Graniel Jr. who will fill up the tubes and set them in place. The project kicked off days before Christmas and, if all goes well, will be completed in two months time. The total estimated cost of the entire project rings up to a total of approximately $90,000Bze and it is believed that the Geotubes are the safest and friendliest way to reclaim beaches. The Geotube technology has been used to stop storm damage, protect the environment, build custom structures, and even build islands where they didn't exist before. Geotube containment technology is a proven, cost-effective method for a variety of shoreline protection and marine construction projects. "the installation of the geotubes is the greenest form of reclamation that does not require any importation of materials, as all materials are found in the surrounding area so it is not a serious concern environmentally speaking." According to research, each geo tube will hold up to 90 to 100 cubic feet of sand and sediments which is equivalent to almost 600 cubic feet of sand dredged from the area. The idea behind the geotubes is two fold, however, the primary purpose is to reduce the velocity of the water and break the kinetic energy of the waves so that all sedimentation will settle. According to SPTC Engineer Consultant, Omar Mitchell, there are some areas of concern as per the way it is being set up, but he plans on holding a meeting with the SPTC today, Thursday. Mitchell explained that areas of concern are the way the tubes are being placed as it should be set up in a way that lies along with the contours. Other factors to take into consideration are the amplitude of the waves and the frequency of them, possible toxins, sediments and turbidity of the area, also need to be taken into consideration. Once the geotubes have been installed, they will eventually submerge to over eight inches at high tide. These sediment bags are made of polyethalene, are rugged, and biodegradable but not indestructible and can last about twenty years. If all goes well in Phase One of the project, Councillor Guerrero explained that there future plans to install geotubes infront of the San Pedro High School which will be the next step to reclaiming the fast dwindling beaches of San Pedro. The plan according to Councillor Guerrero is to create a 40 foot area of beach access and about twenty feet from the extension of the shoreline (geotubes), a swimming area will be dredged and filled with sand so beach-goers can utilize that area and alleviate boating incidents at the Boca del Rio channel. The swimming area will have an approximate radius of 30 feet whilst the depth will range from two to six feet. Other amenities for the park will be the installation of swing sets, play toys and several palapas to get back its park appeal. 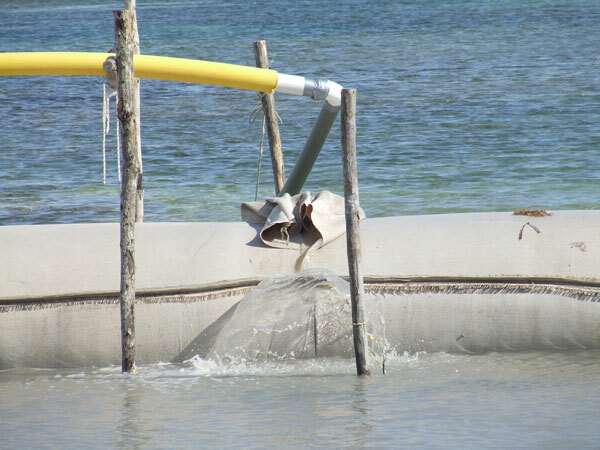 Readers should note that this is not the first time that geotubes have been installed in Ambergris Caye as fifteen or twenty years back geotubes were placed at the Lion's Mosquito Park where erosion was evident. Presently, the Mosquito park shoreline shows no sign of beach erosion and proves that the geotubes work as effectively as it should as we strive to reclaim or re-create our sandy beaches. The Sun will have more on this story in the coming weeks as the work progresses. Central Park: Are the renovations completed?